When working on a production, it is critical to keep work well organized. It is important to create a naming convention chart before starting the project. It is crucial that everyone follows the criteria laid out in the naming convention chart. When dealing with thousands of characters, pieces and puppets, it is easy to get lost. • Character Abby's right arm = ab_r_arm. • Character Abby's right arm, front view = ab_r_arm_f. 1. In the Network or Timeline view, select all the modules or layers to rename or press [Ctrl] + [A] (Windows/Linux) or [⌘] + [A] (Mac OS X). 2. In the Scripting toolbar, click on the Add Prefix or Suffix Script button. If the Scripting toolbar is not visible, you can display it via the Windows > Toolbars menu. 3. Enable the Prefix or Suffix option, depending on what you want to add to the layer's name. 4. Type the prefix or suffix information to be added to the layer's name. Before breaking down the characters for your production, we recommend that you create a drawing name convention that represents the angle used. For example, use "f" for front, "s" for side, "q" for three-quarter so that the drawing name looks like: f1, f2, f3, s1, s2, etc. This will be quite useful during animation and drawing substitution. Drawings are displayed in alphabetical and numerical order. This way, all the drawings for the front view will be together, then all the drawings for the three quarter view, etc. 1. In the Timeline view, select the drawing range to rename. 2. 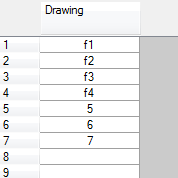 Right-click on the selection and select Drawings > Rename Drawing with Prefix. 3. In the Prefix to Add field, type the characters you want to add before the current drawing name. To rename a drawing, select the drawing and use the Rename Drawing option. Do not double-click on the frame and write a new name, as this will create a new drawing and hide your actual one. Note that the hidden drawing has not been deleted and is still located within the element folder. Simply retype the name and it will reappear.